Biking transportation will gain more attention in Athens-Clarke County Unified Government. On Oct. 27, the Transportation and Public Works department officially began their search for a bicycle, pedestrian and safety coordinator. Whoever takes on the job will oversee the Athens in Motion bicycle and pedestrian master plan, which was approved by the Athens-Clarke County Mayor Nancy Denson and local commissioners on Oct. 2, 2018. The plan outlines strategies to improve biking transportation in Athens. Why it’s Newsworthy: An improved bike network would seek to fill current gaps in bicycle and pedestrian transportation. For Bike Athens, an organization dedicated to making Athens more bike friendly and promoting equity with transportation, the move will ensure bicyclists and pedestrians are given more priority with transportation plans. Athens in Motion includes 117 projects. Tyler Dewey, the executive director of Bike Athens, was part of the citizen advisory committee for Athens in Motion and has been involved in campaigns to get bike lanes. Dewey is also working on 2020 SPLOST proposals. He cites the 2017 passage of the Transportation Special Purpose Local Option Sales Tax (TSPLOST) as a success. TSPLOST began collecting 1 percent of sales tax in April 2018. It will raise approximately $110 million in at least a five-year period, according to the August 2018 final report for Athens in Motion. Of those projected funds, at least $33 million are for bicycle and pedestrian projects. Nineteen projects can be covered by TSPLOST funds. Seven projects include the bicycle improvements program, the pedestrian improvements program, West Broad Area pedestrian improvements, Lexington Highway Corridor improvements, Atlanta Highway Corridor improvements, Prince Avenue Corridor improvements and Winterville pedestrian and sidewalk improvements. Dewey felt it was important for Bike Athens to be a part of the planning of TSPLOST projects. “We knew that the community needed priorities about which projects would go where [and] what projects would be first. We really wanted to work with Athens in Motion about doing a people-focused, equity-focused, implementation and prioritization criteria,” Dewey said. Tim Griffeth, the interim Athens-Clarke County traffic engineer, also contributed to the Athens in Motion bicycle and pedestrian master plan. The plan represents a shift in transportation attitudes. “One of the trends I’ve seen is the move towards bicycling and pedestrian facilities than what we had in the last 35 years,” Griffeth said. 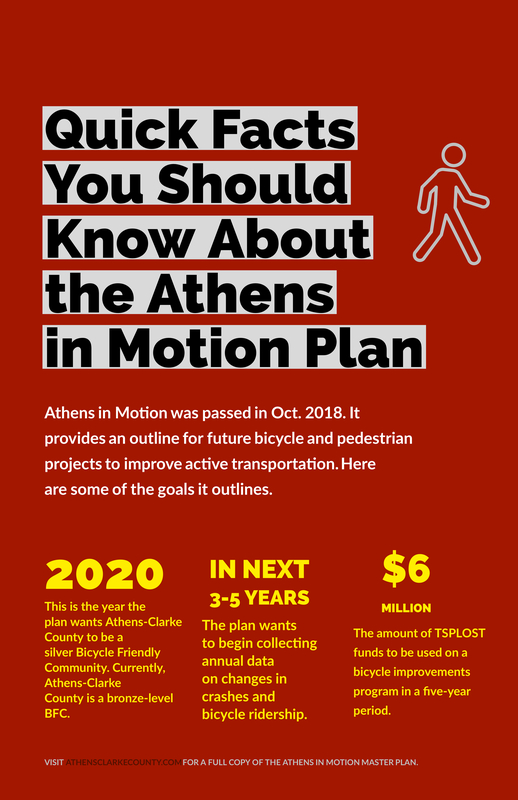 Of the approximately 700 people who were surveyed during the Athens in Motion planning stages, 59 percent of respondents make frequent trips on bicycle. Dependance on bikes as a source of transportation varies, Dewey said. With a monthly average of approximately 129,440 riders in the 2017 fiscal year, Athens Transit remains one of the more heavily-relied-on transportation methods. While there are 20 transit routes, routes are based on US census data. Since it thrives on density, route planning looks at different housing options, such as affordable housing, student housing and residential planning, said Butch McDuffie, the director of the Athens-Clarke County Transit system. However, McDuffie acknowledges there can be gaps between coverage. It is partially the reason for the Bus-N-Bike program, which allows cyclists to attach their bikes to the front of the bus and ride. “The Bus-N-Bike program . . . extends the options of a cyclists. If they live way out on the side of town, they can cycle two or three miles [to] catch the bus stop [and] come into town,” McDuffie said. For those who live outside of transit reach and lack a car, walking or biking might be their only options. Part of the community service for Bike Athens includes taking donated bikes, repairing them, and then giving them to low-income communities. In 2017 they donated 69 adult bikes, 52 holiday bikes for children and completed 202 walk-in repairs. Elliott Caldwell, the executive director of Georgia Bikes, a nonprofit organization advocating for better bicycling conditions in Georgia, advocates for safer bike lanes to make traffic flow better. For roadways without consistent bike lanes, cyclists are forced to ride in the road alongside cars, which potentially slows traffic. With the number of bike programs planned in Athens in Motion, Caldwell said there needs to be a bicycle, pedestrian and safety coordinator to advocate for the bicycle and pedestrian plan. “If the county is serious about doing all of this in the next 10 [to] 20 years, you have to have somebody in this kind of position to basically champion projects, help coordinate things and help push things forward,” Caldwell said. Danny McArthur is a fourth year majoring in journalism in the Grady College of Journalism and Mass Communication at the University of Georgia.